The Cape Cod pianist Marie Marcus came to New York from Boston to do a radio show in 1932, when she was eighteen. Her experience had been limited to Boston radio shows and to playing for a week at a Chinese restaurant called the Mahjong. "Tillie's Kitchen, in Harlem, was a fried-chicken place," she has said, "and Bob Howard, who sounded just like Fats Waller, was on piano. 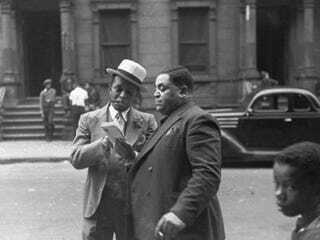 We went up there quite often, and one night Fats himself came in. I remember the whole room lighted up. He played, and then listened, and when I'd finished, he pointed to his heart, and said, 'For a white gal, you sure got it there.' We got to talking, and I told him that I would like to further my education in jazz, and did he know a good teacher? He looked at me and said, 'How about me?' I thought he was putting me on, but he wasn't. He had a small office, with two pianos, in the Brill Building, at 1619 Broadway, and during the next year or so, when he wasn't on the road or making records, he'd call me up and say, 'Come on down and let's play some paino.' You couldn't exactly call them lessons. We'd play duets, and then he'd play, and have me listen carefully to the things he did. He was very serious when we were working together, and I was grateful for every minute. He'd tell me, 'When you're playing jazz, remember the rhythm, remember the rhythm. Make the number of notes count. Tell a story, and get that feeling across to the people. Please the people by making it come from here."